The National Museum of Science and Technology (MUST) in Milan is open to the public with the renewed Interactive Materials Laboratory. The target of this Interactive Lab is to demonstrate the importance and significance of material choice in the realization of the objects that surround us. The Lab has been made possible by the SAES Group together with the partnership between Bayer and Dow in Italy. Becoming a technology partner of the Museum and participating actively in the realization of the i. Lab has been an exciting experience for SAES. 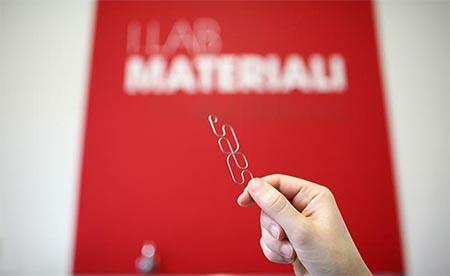 The new Materials Lab provides a unique opportunity to share the pleasure of understanding and experiencing first hand Shape Memory Alloy, a family of biocompatible materials characterized by super-elasticity and the property of assuming predefined forms when subject to specific treatments. These fascinating materials, due to the versatility and creativity of those who believe in their potentials, have opened up new frontiers in the field of consumer electronics, home automation, automotive, and other applications that are yet to explore. SAES is recognized as a world leader in a variety of scientific and industrial applications where stringent vacuum conditions or ultra-pure gases are required. An important project for technological diversification and strategic repositioning, which began in 2000, led SAES to include among its expertise in special metallurgy and materials science those most closely related to the shape memory alloys. Today, the Group is a world leader in the biomedical sector, which already appreciated these materials for advanced applications, and pioneers of their use in the hi-tech industries. To be at the forefront of future technology and advanced materials is a mindset of SAES and we are happy to share our approach with those who will visit this Lab.